Air Operations - the LAFD operates a top-flight Air Operations Unit at Fire Station 114 on the grounds of Van Nuys Airport (KVNY). The LAFD helicopter fleet is a combination of Medium and Light helicopters and is staffed 24/7 by a crew of pilots, aeromedics and helitac members. The mission of LAFD Air Operations includes brush fire suppression, air ambulance transport, high rise fire response, and hoist rescues. 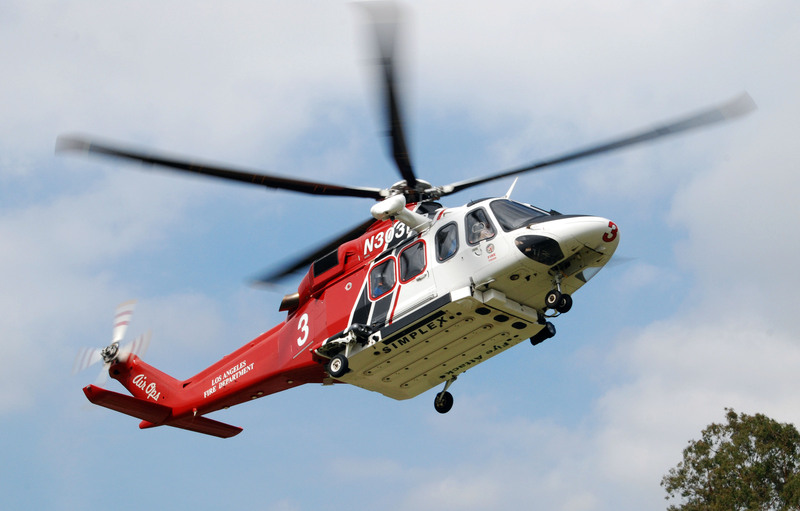 This is one of the LAFD's four Medium duty helicopters - an AgustaWestland 139. Its Pratt & Whitney Canada PT6C-67C turbines, together with a state-of-the-art 5-bladed main rotor, deliver a high cruise speed even in demanding conditions at all weights. The pilots also utilize state-of-the-art night vision technology to assist ground operations and enhance safety during nighttime operations. Leading-edge technology includes a Honeywell Primus Epic fully integrated avionics system, a 4-axis digital AFCS and large flat panel colour displays in the cockpit. As a result of the new design approach the AW139 uses fewer components, benefits from integrated avionics and provides easy accessibility to all systems for simplified maintenance tasks. A 350 gallon water tank is attached to the bottom of the airship. In 2017, the Department retired the last of its venerable Bell 412s, the longtime workhorse of the fleet. In April 2018, the Los Angeles City Council approved the purchase of a fifth new AW 139. The newest helicpoter is scheduled to join the fleet in April 2019. The LAFD also uses two Bell 206 light helicopters for training and HELCO (Observation) duties. All LAFD pilots are sworn members of the Department and initially trained and worked in the field as firefighters. After completing at least four years in the field as a firefighter, and obtaining the necessary FAA pilot licensure on their own time, a member may apply for a position as an LAFD helicopter pilot. Once accepted into the program, members receive initial City flight training from the LAPD, which maintains a robust helicopter program of its own, followed by at least two years of LAFD Air Operations training. In total, the LAFD pilot training pipeline takes approximately four years to complete.